How Jony Ive Masterminded Apple’s New Headquarters - The Wall Street Journal. Sir Jonathan Paul "Jony" Ive, KBE , is a British industrial designer who is currently the Chief Design Officer of Apple Inc. He oversees the Apple Industrial Design Group and also provides leadership and direction for Human Interface software teams across the company. Ive is the designer of many of Apple's products, including the MacBook Pro, iMac, MacBook Air, Mac mini, iPod, iPod Touch, iPhone, iPad, iPad Mini, Apple Watch and iOS. 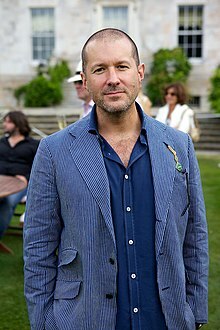 Chief Design Officer at Apple Inc.
Sir Jonathan Paul "Jony" Ive, KBE (born 27 February 1967), is a British industrial designer who is currently the Chief Design Officer (CDO) of Apple Inc. He oversees the Apple Industrial Design Group and also provides leadership and direction for Human Interface software teams across the company. Ive is the designer of many of Apple's products, including the MacBook Pro, iMac, MacBook Air, Mac mini, iPod, iPod Touch, iPhone, iPad, iPad Mini, Apple Watch and iOS. Ive has received a number of accolades for his work. In 2003 he was the inaugural winner of the Design Museum's Designer of the Year Award. In 2004 the BBC named him the most influential person on British culture. In 2006, he was appointed as an Honorary Fellow of the Royal Academy of Engineering, and in 2012, he was knighted at Buckingham Palace for "services to design and enterprise".